(Livescience.com) A never-before-seen subatomic particle has popped into existence inside the world's largest atom smasher, bringing physicists a step closer to unraveling the mystery of how matter is put together in the universe. After crashing particles together about 530 trillion times, scientists working on the CMS experiment at Switzerland's Large Hadron Collider (LHC) saw unmistakable evidence for a new type of "beauty baryon." Baryons are particles made of three quarks (the building blocks of the protons and neutrons that populate the nuclei of atoms). Beauty baryons are baryons that contain at least one beauty quark (also known as a bottom quark). The new specimen is a particular type of excited beauty baryon called Xi(b)*, pronounced "csai-bee-star." The discovery was announced Friday (April 27) in a paper released by the CMS collaboration (CMS stands for Compact Muon Solenoid, one of a handful of detectors built into the 17-mile, or 27-kilometer, underground loop of the LHC machine). 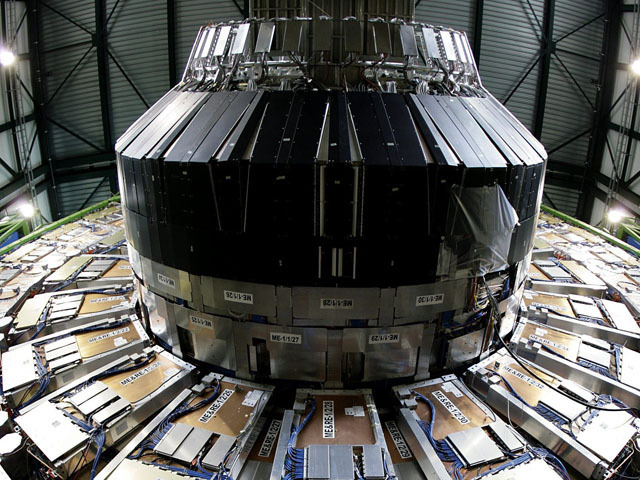 "It's very rewarding," Vincenzo Chiochia, a University of Zurich physicist working on the CMS experiment, told LiveScience. "We work for projects that run for several years - from conception to data taking, it can take more than 10 years -- so when you actually come up with a discovery, and you know this particle collider is among the few that can produce it, it's extremely exciting." The Xi(b)* particle had been predicted by a physics theory called quantum chromodynamics, which predicts how quarks bind together to form heavy particles, but had never before been observed. "It was expected to be more or less where it was found," Chiochia said. "Not all of those heavy states have been discovered, so you have to look for all those particles. It may well be that the theory is not complete. In this particular case it was expected, but we have to keep looking for things that are unexpected." And the researchers hope that with a little more time on the LHC, even more of these unseen particles will be found. Exotic bits of matter like Xi(b)* are very unstable, and only exist for fractions of a second. They burst into being out of the abundance of energy released when two protons slam into each other head on inside the collider. Almost immediately, though, they decay into other particles, and some of these things are what physicists see inside the detectors. The CMS researchers analyzed the results of trillions of collisions to find the signatures of the descendants of Xi(b)*. "The collisions produce an enormous amount of tracks," Chiochia said. "To join the dots and find exactly which particle comes from which decay is actually not easy. What makes me confident is that if we can find this complicated chain of reactions at the LHC, then we must be in a really good position to find [other] heavy particles." In addition to the other missing particles predicted by quantum chromodynamics, the LHC researchers are eagerly chasing another elusive quarry - the Higgs boson. This rumored particle is thought to explain why all particles have mass. Many scientists at CMS and one of the LHC's other experiments, ATLAS, say the particle is in their sights, and they hope to be able to claim a discovery of the Higgs boson by the end of this year.